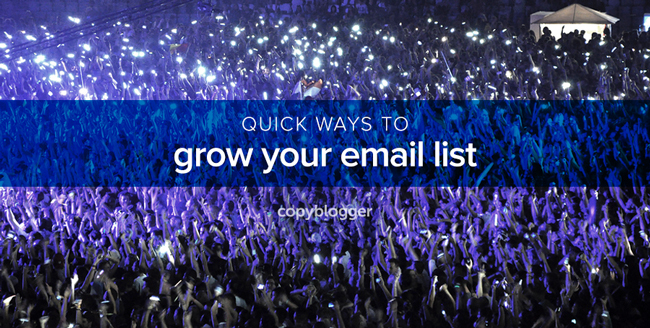 I know building your email list can be a painfully slow process. Even if you have a tantalizing incentive to give away, sometimes your prospects may still be hesitant to sign up. Since readers are increasingly cautious about giving up their email addresses, you need to build trust and put in extra effort to turn casual readers into email subscribers. While the top of your site’s sidebar is the “traditional” spot for an email list opt-in form, you don’t want it to be your sole method for collecting email subscribers. Today, I’m going to share improvements you can make to your site to grow your email list — and many take five minutes or less to implement! How else can you get readers to subscribe? If a site visitor takes the time to read one of your blog posts all the way to its end, he or she probably likes your content — so the footer of a blog post is the perfect place to ask that reader to sign up for your list. You can add a permanent footer to each of your blog posts that prompts readers to join your list. Feature boxes put your opt-in form front and center on your website, taking the place of a large graphic banner with your logo or other site branding. A qualified designer can add one to your WordPress theme or you can use a theme with a built-in Feature Box, like StudioPress’s Generate Pro theme. Pop-over opt-in forms are small boxes that pop up in the corner of your site (often in the bottom right corner). They are less obtrusive than large, traditional pop-up boxes, and your reader can either take action — by entering their email address or closing the box — or they can simply ignore the box and continue consuming your content. One of the best tools right now for creating simple pop-overs on your site is Sumo’s List Builder tool. List Builder is completely free, and it’s fairly quick to set up. Adding Sumo to your Rainmaker Platform site is a breeze, whether you use the native integration feature (currently in Labs) or simply paste your script into your header using the Appearance editor. Putting a pop-up box on your site is highly contentious — using pop-ups may increase your sign-up rate, but it could also damage your relationship with your audience. If you decide to use one for your site, the incentive you offer needs to be highly relevant to your readers. A delay before the box appears is also a smart practice. This way, readers have a chance to momentarily browse your site before you present them with your pop-up box. Once you’ve figured out where you want to put the opt-in or registration calls to action on your site, you need the right copy to “sell” what you’re giving away. Communicate your offer. If you have a free email autoresponder course, say that. If it’s a downloadable report, make that clear. Keep in mind that the title of your free incentive can do a lot of work for you — if you have an attention-getting, mouth-watering title, you probably don’t need to add a lot of additional copy. Describe your sign-up incentive’s specific benefits. How will your free incentive help your visitors? Will it save them time, make them more money, or improve their relationships? This is a great place to use bullet points, if you have the space for them. Don’t just go with your gut or take your best guess — test several opt-in and registration structures and several copy combinations until you find the ones that work best for your community members. Yes, it takes extra time to test. But once you do, you’ll feel confident that you’re using the highest-converting version of your offer. Growing your email list should be a top priority, and paying special attention to your opt-in forms is a strong step in the right direction to reaching your subscriber goals. Finding the perfect opt-in for your website takes patience and persistence, but smart content marketers have both. Keep trying, continue testing, and stay focused!